This is Dream5's Akira (Purple), Momona (Blue) and Yuuno (Pink) Dancing. Enjoy. Because Tsunku IS his own biggest troll, he's created a piece of genius with Because Happiness by Berryz Koubou and Shiawase no Tochuu by C-ute. It's such a beautiful Ballad. It shows off the girls voices nicely. I really wanted to like this song when I first heard it. It was happy and upbeat but i thought it was lacking something, like it wasn't quite finished. There are loads of empty spaces in it and i got frustrated with it. I felt like Tsunku wasn't paying attention to Berryz and gave them a half finished song. I've tried to combine the lyrics of both songs and who is singing what lines. Projecthello.com has the lyrics for both but only C-ute's song is colour coded. I've only listed solo singers but if it's no right, let me know and i'll change it. DAARIN Kashi ni tsumaru kedo [SS]dou omou? 1. The emotional part of human nature; the seat of the feelings or sentiments. 2. A human being; person. 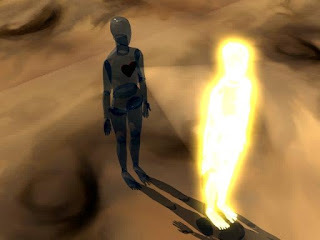 Soul as the personality: Some Christians regard the soul as the immortal essence of a human – the seat or locus of human will, understanding, and personality. A soul describes the person's personality, like a kind soul. These are all definitions of what a soul is. I like how my granma put it, "A Soul describes the person's personality" But to me, it also incorporates what the dictionary said "The emotional part of human nature; the seat of the feelings or sentiments." And also the amount of passion someone has, like I have a passion for sewing which has taken me years to find, but I’m now so focused on it that I was able to teach myself many things. So when a certain 13yr old joined a certain group who I hold dear in my heart for helping me get out of the depression of a break up with emotional songs like Kanashimi Twilight, Naichau Kamo and Shouganai Yume Oibito, I get frustrated with the lack of said emotion in her voice. I’m not saying that Sayashi Riho isn’t talented, because she is; I’m just saying that I find she lacks things that make me, a Morning Musume fan, consider not listening to their songs that she is featured on. I need to explain myself. What I’m getting at is that I cannot feel anything when she sings. For example, Give me Love, Ai puts in so much emotion in to that song which continues on through into Tanaka, but as soon as Riho opens her mouth, all of that feeling goes out the window and that song is now void of any emotion. No matter what happens after her parts, no matter how much emotion Gaki and Ai put in afterwards, I find it hard to regain the feelings I had when the song started. I know that this might classify me as a Riho hater and judging by the nickname I gave her and the title for this post, that might be true. I’ve given other girls nicknames like Momoworld for Momoko because I think she’s in her own little world and nothing anyone says or does can being her out of it, and Yurina has BFG (Big Friendly Giant) because she’s so gentle and friendly while towering over majority of the Japanese population. Everyone has personal nicknames that give their Idols whether it’s a good one like BFG or a negative one Like the one another blogger has for Captain, it’s ‘The Blob’ but I can’t remember why they gave her this nickname. It doesn’t mean we hate the girls, I make it a point not to hate people I have never met with the exception of the British government and silly little girls who think that because they have a pram, the world must revolve around them, it just means we (might) have a special bond that’s hard to describe with them. And just to clarify, I hate those strangers because I have a valid reason to hate them. I don’t, however, have a reason to hate on a girl who just wants to sing and dance and I will not hate on her, her management or her producer for putting her in a position for receiving hate, even if said producer is a troll (Sorry Tsunku, you are a genius but you also are your own biggest troll). Now, onto the reasons for the nickname. I just find that she not only needs more singing lessons, but also lessons on how to show emotion. It might be that she's been so focused on trying to get into the industry that she's forgotten that she needs her soul. It's the softness that is missing from her performance. This softness is what makes great songs like Furusato and Shouganai Yume Oibito work even with Tanaka's opposing looks. It's the emotions, the soul, that makes people want to buy Takahashi Ai's PB's, and it’s what makes Ai a great performer. Tanaka has this when she sings (I know I’m praising Tanaka now) and Sayu has this when she's performing on variety shows. Emotions are what makes us human. Without them you can't possibly be able to live. Which leads me to my next point, Riho needs to show emotion when she performs. She needs to learn this asap as it's something that isn't natural to her. It's natural to the rest of 9th gen. Fukuhime's kindness and elegances, Zukkie’s shinning personality and how she doesn’t care about how embarrassing her bug impressions makes her look and Eripon's........loveable awkwardness. Even 10th gen, from the little I know of them, have more soul that her. Haruna's love for Sayu and keeping herself beautiful, Kutie Haruka's Bossy nature and Masaki's air headedness. Even though Ishida is her junior, she could learn from her. Ishida has experience in being an Idol from her days as Dorothy Little Happy's backing dancer. Just looking at the pictures that have been floating around, you can see that she has a passion for being an Idol. 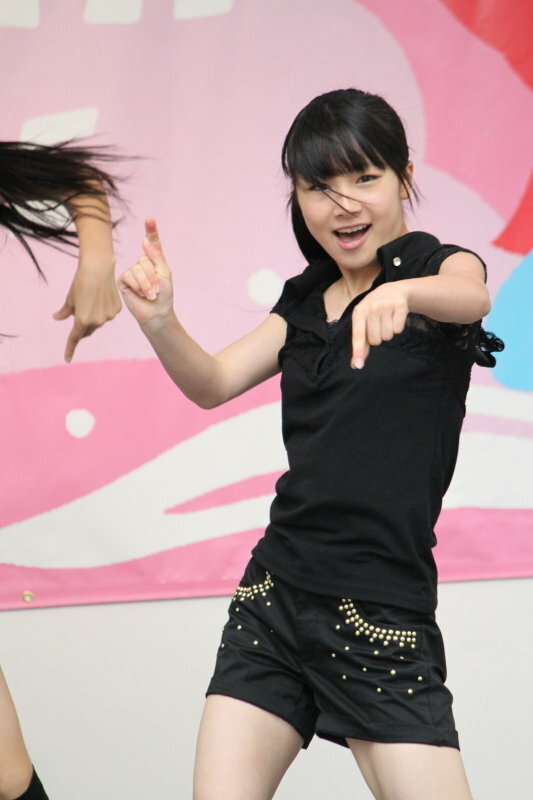 The only time I see that passion in Riho is when she's doing a fierce dance or dancing hip hop. It’s not present when she isn’t dancing anything fierce. When you look at the girls performing, Riho’s face always looks the same. She’s not smiling or showing how much she wants to be on that stage. It’s understandable that 9th gen will be trying hard to keep up with their sempais but when the camera (eventually) finds Zukki’s face, you see this happiness coming from her. You see this too from Eripon and Fukuhime, you see their passion coming out even during MC’s. I’m not saying that she needs to smile throughout every song but she need to show how much she wants to be there. If Gaki didn’t have this passion, would she have stayed for nearly 11years? Would Sayu have stayed after Eri left? I do admit that she has some passion otherwise she wouldn’t be in the group, but it would be nice for her to show it more otherwise i wouldn’t have given her this nickname. Now onto her lack of talent. I’m not saying that she isn’t talented because anyone can see that she is. She just lacks the talent to sing without making peoples ears bleed. Sayu used to make my ears bleed when I was listening to early Momosu songs, but now I can happily listen to her sing as long as they don’t overdo the auto-tuning. In terms of the new members, Zukki has had the lease amount of training out of all of them but she has a natural talent for singing that Riho does not have. Moving onto modelling, Riho has the same expression on her face even when she’s standing in front of an audience, that’s only if she isn’t standing inbetween Eripon and Zukki as their personalities shine even when they’re not talking. When it comes to PV’s I’ll forgive her this once for the Renai hunter PV as she has tried to show some different expressions, but she needs to sit and watch her sempais more when the go to film the PV’s for her to get an idea on what expressions to do then go practice in front of a mirror. I think I’ve heard that Eripon does this. If she has, look how much better she’s been getting in PV’s. The same practice can be used for when she takes pictures, you can look at a set of pictures taken of her for promotional use and majority of them has this stupid smirk that she is now, sadly, famous for, which personally pisses me off. Having one expression, for me, is a big no-no. 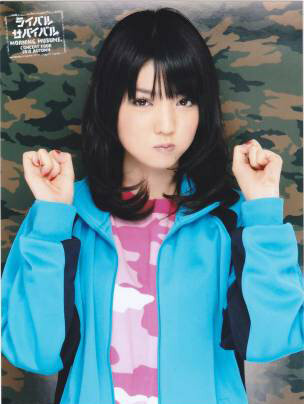 Risako is famous for her pout. She’s constantly using it, but it doesn’t piss me off because there is some variety in it. No too pouts are the same, so therefore, no too smirks should be the same for Rigo also, right? No! There all the same. Although she is still new at it, along with the rest of 9th and 10th gen, she needs to study Sayu, each and every shot is different. She has soft shots, happy shots, cute shots, the standard Jan-ken-pon Idol shots and when she has her PB’s, she shows even more expressions than we see for promotional pictures. What it comes down to again is having the ability to show emotion. When 10th gen became active, there was a photo shoot she did with Masaki. In this photo shoot, Masaki had my attention with how natural she was in the pictures, while Riho looked so stiff. It reminded me of the photo shoot that Airi did with Wantanabe Mayu for B.L.T last year. (Now expecting a load of hate) While Mayu looked as stiff as a board, Airi looked so natural and my attention was naturally drawn to her. Maybe it was because I know more about Airi and less about Mayu, but Airi’s expressions in those photos’s looked more natural while I felt Mayu’s expressions looked false and forced. So while Masaki has this natural ability to be an idol, Riho does not have it yet. There are some things in the world that would take some people years to develop but others have naturally. SDC has the natural ability to dance fiercely, something which some people have a hard time doing, but she needs to work hard at all the other things the rest of the group has. Now, I’m not saying that the rest of the group naturally has what she is lacking. For instance, Sayu has had to work hard in both performing and personality to get where she is today, all she had going for her during her auditions was her looks and her determination to join the group. She was weak in both singing and dancing and she was shy when she first started. She still is weak in those areas and has admitted that she is still shy, going on to say that Eri was her best friend and that when she announced her graduation, it forced her to interact more with the other members. But by just looking at her, you would never know that as she always seems to be friendly with everyone. Maybe in a few years, she will develop more and work hard at expressing emotion and gain a personality that will shine as bright as the rest of her generation, but until then, I will continue to call her Soulless Demon Child. Just as the title says, i'm disappointed with this single. It's not the song because i think it is one of their best singles, it's the crab dance and the line distrubution. The distrubution isn't as bad as Resonat Blue (all Sayu, Aika, Linlin and Junjun sang was "Wow".) and we don't know if Aika even sang on this single because we never see her lipsycning in the PV but this really stinks. How do they expect Haruna and Masaki to improve if they don't sing? How can they establish new singers for the group if when Gaki leaves, we'll be left with Renia,Sayu and SDC singing lead on all singles? Fukuhime and Kutie Haruka have the strongest vocals to help lead the group after Gaki's gone. Zukki is slowly behind them but need more experience to improve her vocals for live performances and i'm not to up-to-date with Ishida's vocals to really judge how good she isand we all know that Eripon and Haruna have the weakest vocals out of all the new members. I'm just worried that the vocal quality that i've come to love about Momosu will go down when Gaki leaves. UFA knew that they needed to replace Ai's talent and thus, we had 2 generations added because they couldn't find the vocals they needed during 9th gen auditions. But to not establish any of 10th gens as a new minor lead is worring me. So Ishida is singing more than the rest in this single, but she's not actually singing any solo's and to me, that isn't establishing her as a minor lead. What SDC and Sayu are doing in this single is what i call a minor lead. Aika isn't back to performing with the group in singles so it's hard to tell is UFA are going to push her vocals more. I guess waiting till their next single preview is released will clear up some of my questions but might also produce a load more as well. 1. These girls are NOT CRABS!!! 2. These girls are NOT CHICKENS!!! 3. These girls are NOT ANIMALS FULL STOP!!! On a side note, if you haven't guessed by now, Soulless Demon Child is Sayashi Riho. I'm currently trying to write a post as to why i have given her this name, but i'm trying very hard to make it sound nicer than how it sounds in my head. It would be nice if someone would be willing to read it for me and give me some pointers on it before i post it.